We are looking for a new manager for our Conservatives Concerned About the Death Penalty project. The right person could help end the death penalty from anywhere in the country. Could it be you? Check out the full job description and apply here. A new report by Conservatives Concerned About the Death Penalty has found a surge in the number of Republican lawmakers who sponsored death penalty repeal legislation at the state level. The report – called The Right Way – looks at all death penalty repeal bills filed since 2000, using the increase in sponsorships as a measure for growing Republican leadership on the issue. The number of Republican state lawmakers to sponsor death penalty repeal bills increased sharply since 2012. From 2000 to 2012, it was rare for Republican state lawmakers to sponsor death penalty repeal bills. In 2013, the annual number of Republican sponsors more than doubled. By 2016 ten times as many Republicans sponsored repeal bills than in 2000. More than 67% of the Republicans sponsoring death penalty repeal bills did so in red states. CCATDP formed in 2013 to shatter the myth of universal conservative death penalty support. With your help, I believe that we have accomplished that goal. Grassroots conservatives and many well-known political thought leaders are now openly questioning capital punishment with great frequency. A mere four years since our founding, we have proof that conservative lawmakers are also increasingly supporting death penalty repeal. Today at a press conference at the National Press Club in Washington D.C., we unveiled our report, “The Right Way,” which demonstrates this point. Florida’s death penalty system has come to epitomize the typical big, dysfunctional government program. It is marred by failures, including wrongful convictions and rising costs. 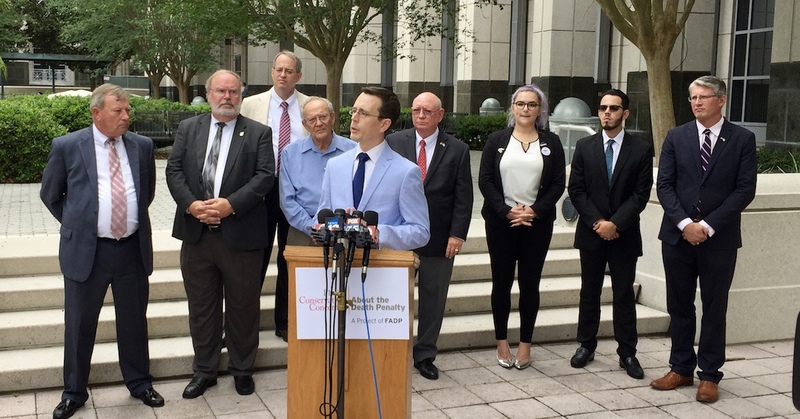 It fails to adequately protect society, often harms murder victims’ families, and the Sunshine State’s capital sentencing scheme has been declared unconstitutional twice in just the last year. As a result, roughly 200 people on death row must be resentenced. As the death penalty’s many shortcomings have come to light, an increasing number of notable conservatives from across the country have turned against it. Many in Florida have taken note of CCATDP’s activities and reached out to me, asking how they can become more involved. In the past month, we’ve been confronted with our death penalty system’s dangers and flaws again. Rodricus Crawford was released from Louisiana’s death row in April and Ralph Daniel Wright Jr. from Florida’s death row just days ago because they had both been wrongly convicted and sentenced to die. Regrettably, this isn’t a rare occurrence. In fact, these exonerations bring the total number of wrongful capital convictions in the US since 1973 to 159, while others have been executed who might have been innocent. The Oklahoma Death Penalty Review Commission concluded its year-long examination of the state’s capital punishment program, and their findings reflected what has been discovered in many other states. Oklahoma’s death penalty is dangerously flawed, has led to wrongful convictions, and it costs far more than life without parole. On April 11, we released a letter that has received national attention. It was signed by 25 notable Virginia conservatives calling on Virginia Governor McAuliffe to halt the planned execution of Ivan Teleguz. His execution is scheduled for April 25, despite a complete lack of physical evidence and the fact that two of the three witnesses who originally linked him to the crime have since recanted their testimony. The third witness had incentive to lie because he received a lighter sentence in exchange for testifying against Teleguz. Considering all of this, there is simply too much doubt to execute Teleguz, and there is reason to believe that he may actually be an innocent man. Thus, pro-life conservatives in Virginia signed the letter respectfully asking Gov. McAuliffe to commute Teleguz’s sentence. You can read it in its entirety and see the signatories here. Last week, Florida State’s Attorney Aramis Ayala announced that she will not seek any death sentences during her tenure as the prosecutor in the 9th district (serving Orange and Osceola Counties). This is welcome news given that Orange County has historically been one of the leading death penalty counties in America. There are good reasons to eschew capital punishment. It costs millions more than its alternatives, doesn’t protect society, and can harm murder victims’ families. Most importantly, it risks innocent lives because the criminal justice system is dangerously fallible. Consider the recent report from the University of California Irvine, where researchers found that more people were exonerated of various crimes in 2016 than in any other year – a total of at least 166 people from only the 25 states that were studied. The same fallibility that led to these wrongful convictions also affects capital cases, and as such, Ayala should be commended for her decision to avoid death sentences during her term. At a time when the world – and the country, especially – is so polarized, many are looking for leaders that can build bridges and cross the divide. EJUSA has been building these bridges for over 20 years, among law enforcement, crime survivors, Evangelicals, conservatives, and more. This month’s Harper’s Magazine takes an in-depth look at some of that work, sharing the story of EJUSA’s project, Conservatives Concerned About the Death Penalty. In profiling several staff and highlighting our values of finding and forging common ground, the story gives hope that we can make progress when we build relationships and work together on the issues we care about. Late last month, after serving several years on Delaware’s death row, Isaiah McCoy was released and acquitted of the murder for which he was originally convicted. There was no physical evidence linking him to the crime, and the testimonies that were used against him were inconsistent. Despite this, McCoy was sentenced to die, but after receiving a new trial, he was acquitted of murder. Upon hearing the news, McCoy wept and said that he plans on spending the coming days with his daughters. McCoy is the 157th person to be released from death row due to a wrongful conviction.